​​​​​​​Caramel bread pudding is a melt in mouth pudding made with caramel and bread slices. This pudding is prepared by steaming method and hence no need of an oven in this recipe. Steaming can be done in a pan / pressure cooker / an electric rice cooker. 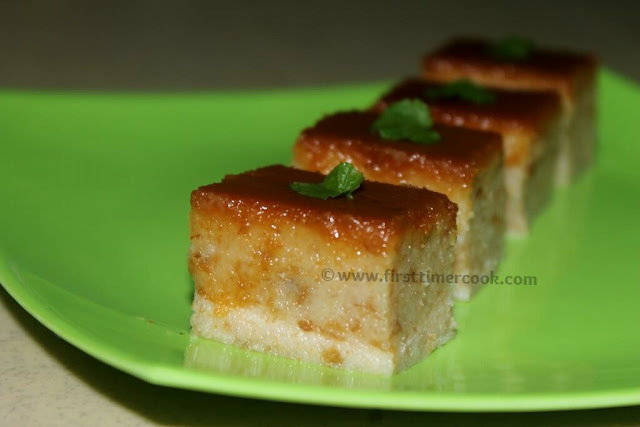 Dry fruits like cashews / raisins / almonds also enhances the flavor of this pudding. Just chopped the dry fruits and add them before steaming. Below is the step by step method of preparation. Tear the bread into pieces and add milk to it. Mash it well with a masher. Mix vanilla & sugar and then keep aside. Pour the caramel into a mould and tilt to coat the bottom and a bit in the sides as well. Let it set for two minutes and pour the bread mixture to it. Take a pressure cooker & fill it with 3/4 cup water. Place the mould with bread mixture inside covering the mould with aluminium foil & holes pricked there by a fork for the steam to escape. Close the pressure cooker with lid without putting the weight valve / whistle. Steam it for 20-25 minutes. After that, cool down and keep it in refrigerator for minimum 2 hours. Then invert it on a plate & cut into desired shape before serving ! Any type of dry fruits can be put over pudding if desire while serving. Don’t add more milk or sugar than mentioned. The pudding by itself is very much sticky. So adding more of any one of the above may not set the pudding properly. To enjoy the fullest flavor, give at least a day for setting before serving.